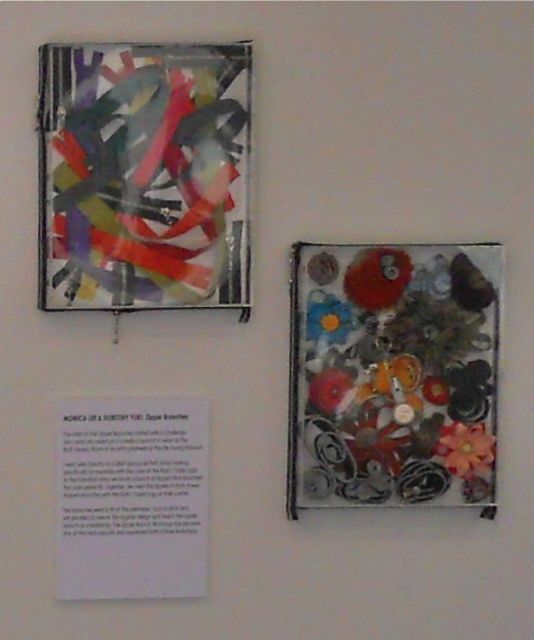 On Friday, June 1, Ruth's Table gave a wonderful reception for a Retrospecitve show. Aiko Cuneo, Monica Lee, Tomoko Lipp and I are featured. All of us had something to do with the art program that Ruth's Table gives to the community with the leadership of Lola Fraknoi and her assistant Megan Coss. We had so much fun with all the people who came to the event. They participated in a communal art project that came together at the end of the evening. 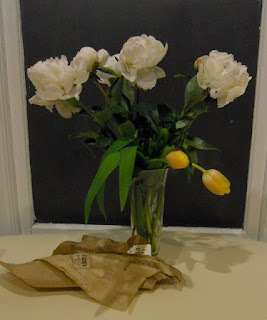 These were flowers given to me by Lola, beautiful peonies and the tulips are from my thoughtful friend Megumi. 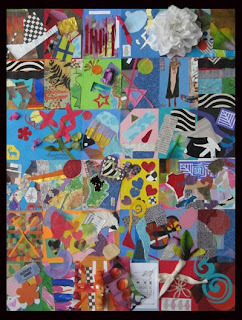 With a collection of recovered zippers, I made a collage of them in one frame and put finished zipper pieces that Monica and I made in the other..I used a heavy zipper around the frames as a support....The center gold zipper flower is one we made for the VIP's who attended the reception of Ruth Asawa's film documentary of her life showed at DeYoung Museum. 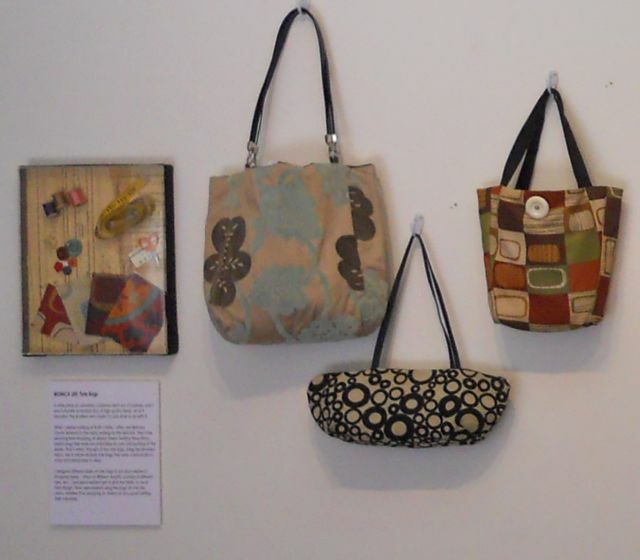 Monica laid an old pattern paper as her base ground and added pieces of her recovered fabrics and added sewing implements to indicate what was used to make the totes, as supports, I surrounded the frames with the webbing we used for the handles of some of the tote bags. These totes are Monica's. 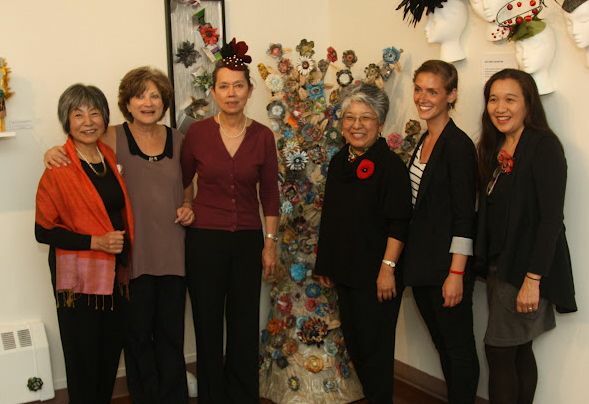 Tomoko, Lola, Aiko, me, Megan, Monica..we are standing in front of Tomoko's tree of newspaper flowers made by many friends of Ruth's Table lead by Tomoko. 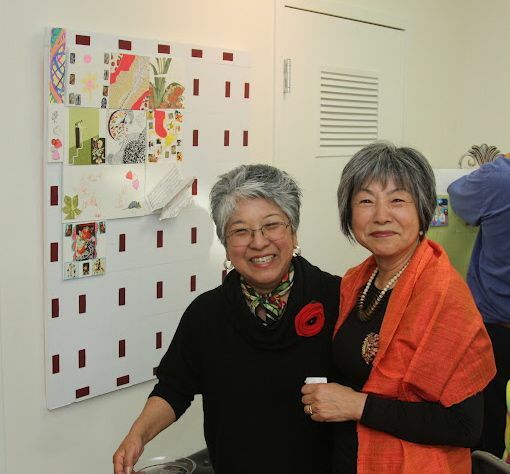 Tomoko and I in front of the beginning of the other communal project. 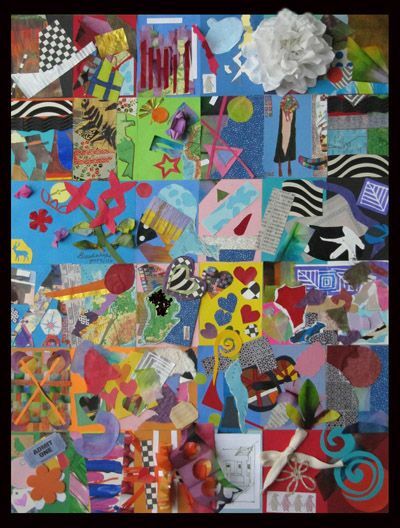 Aiko's communal collage project completed.